Runner-up Jonathan Rea (left) on the podium in Thailand with race winner Alvaro Bautista (centre) and Alex Lowes. 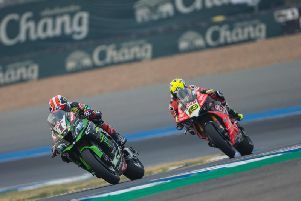 Spain’s Alvaro Bautista left his rivals trailing in his wake as he wrapped up a treble in Thailand to make it six wins from six in the World Superbike Championship. The Aruba.it Ducati rider followed up his victory on Saturday at the Chang International Circuit in Buriram with victory in the Superpole sprint race. The 34-year-old then completed his treble with an all-conquering ride in the second 20-lap race on the Panigale V4 R.
Alvaro Bautista leads Jonathan Rea in Thailand. As he did on Saturday, reigning champion Jonathan Rea finished as the runner-up in both races, when the Kawasaki Racing Team rider simply had no answer to World Superbike rookie Bautista. The former 125cc Grand Prix world champion has built up a lead of 26 points at the top of the table over Rea following his dream start to the championship. He crossed the line with 10 seconds in hand over his Kawasaki rival in the final race of the weekend, with Rea holding off Pata Yamaha’s Alex Lowes to secure his sixth successive runner-up spot this season. Michael van der Mark (Pata Yamaha), Kawasaki’s Leon Haslam and Marco Melandri on the GRT Yamaha were the top six. 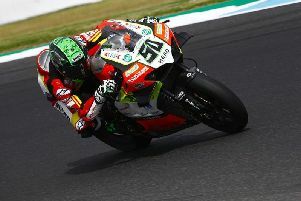 Eugene Laverty experienced more bad luck after a technical issue with his Team Go Eleven Ducati resulted in a DNF. Wales’ Chaz Davies (Aruba.it Ducati) and Tom Sykes (BMW Motorrad) also failed to finish the race due to technical problems. Bautista emerged victorious in the earlier Superpole race, which was halted prematurely due to a red flag when Leon Camier (Moriwaki Althea Honda) and Thitipong Warokorn (Kawasaki Thailand Racing Team) collided at Turn 3. The Thai rider was taken to hospital for further assessments. Rea had taken the lead but Bautista made a pass at Turn 3 on the first lap, only for the Kawasaki rider to cut back underneath him and regain first place. However, the Ducati powered past on the straight and Bautista led into Turn 4 to hit the front. He remained there until the red flag came out, claiming the win by two seconds from Rea, who in turn was 0.4s ahead of Lowes. The top six was finalised by Haslam and Melandri. Eugene Laverty, who was lucky to escape unhurt after a huge crash on Saturday following a brake problem with his Ducati, did not start the race. The third round of the championship will take place at Motorland Aragon in Spain from April 5-7.